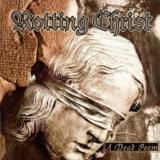 A reissue of Rotting Christ's fourth album, originally released in 1997, this is a must-have for those who have somehow managed to go nearly twenty years without hearing the original. It represented a change in sound for the band at the time, moving away from the black metal of before towards gothic doom of the Paradise Lost variety. Yet it wasn't an enormous change in sound for Rotting Christ, whose black metal was always mid-paced, atmospheric and backed by keyboards, but part of a natural progression. The music here is, as before, dominated by guitars, melodic, atmospheric, and clean vocals are kept to a minimum. There are fewer keyboards than before, if anything, and the similarities to Paradise Lost are more stylistic than actual (let's not forget that Paradise Lost released One Second in 1997, which sounds nothing like this) and fade after the first couple of songs. The real draw here is the solid songwriting, something frontman and guitarist Sakis and drummer brother Themis have always excelled at. With a line-up completed by bassist Andreas Lagios and a guest spot from Samael's Xytras on keyboards, this is possibly the best of Rotting Christ's mid-period. It certainly holds up today. Opener Sorrowful Farewell has a weirdly infectious groove, immediately Paradise Lost-y at first but soon leaving that behind with Sakis' snarled vocals, and building into a Insomnium-esque epic. The following Among Two Storms is more melancholic with clean vocals from Moonspell's Fernando Ribeiro – probably the catchiest track present, and interesting that it's the only song present with clean vocals when it would have been quite easy to write an album full of gothic anthems. Rotting Christ are aiming higher, however, and the album continues in a more interesting if less immediately catchy, the whispering of the title track making for a suitably spookily atmospheric track. Songs vary in riffs but keep a consistent style, growing on you with each listen. The guitars continue to lead, almost heavy metal riffage on the likes of Out of Spirits contrasting well with the keyboards and snarled vocals, grandiose and miserable on As if By Magic. Few would call this Rotting Christ's best period – it's threatened by their earlier black metal material, and the more recent epic metal albums are better. Yet fans of the best kind of gothic metal, the classic atmospheric doom-and-gloom variety without female vocals, will find much to love here. There's little to recommend this reissue itself over other versions, as far as I can tell it isn't remastered. A tribute to the original's rich production (performed by Xytras).